We are down to the countdown this week, so it is time for some serious baking. I did a ton for Thanksgiving and to use as gifts, but now it is time to refill all the cookie jars and freezer for some sweet treats for Christmas. I got another jump on cookies too. Chocolate Chip, Chocolate Crackles, Sugar Cookies and a loaf of Pumpkin Bread. Sift together flour, baking soda, baking powder and salt. Set aside. Work butter until soft, then work in sugar a little at a time until smooth. Beat in eggs one at a time, add the vanilla, grated lemon rind and bananas. Stir in flour mixture alternately with sour cream. Pour into a greased loaf pan & bake in a preheated 350 degree oven for 1 hour, or until a toothpick comes out clean. Remove from pan & cool on a rack. I love mine glazed with a mixture of conf. sugar and a little milk. 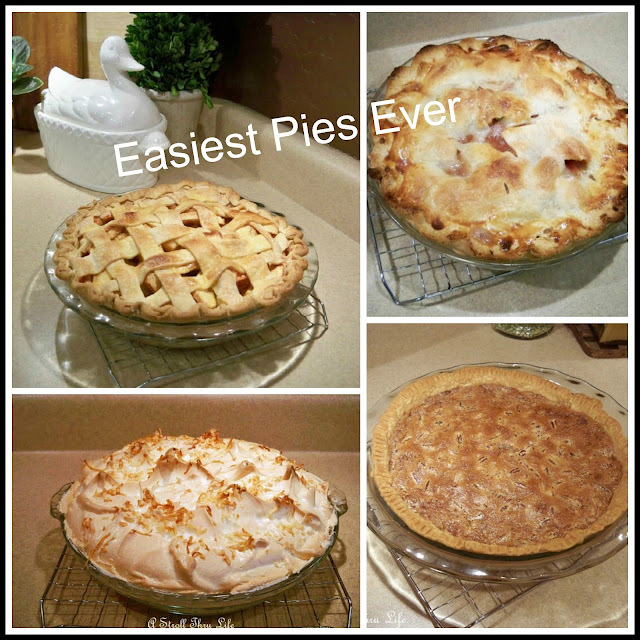 Check out this post for all my recipes for some of the easiest pies ever. Saturday will be pie day. I will need two for my daughters on Christmas Eve and two for here on Christmas day, then I have some out of town family coming for the 26th, so all in all the whole family will be here for a big get together and visit, so I will have 22 for that day. I think I will make a cake and two more pies plus some of the cookies and breads for them too. I have a ton of baking to do and get in the freezer, I have a lot of mouths to feed. (For the meal on the 26th we will just have cold cuts and cheese trays with a huge assortment of breads, veggies, dips and chips. For 22 keeping it simple is my motto. I want to be able to visit and enjoy everyone. This is going to be a really busy kitchen the next couple of days, so I better get busy. How about you, do you have a lot of baking and cooking to do too? MMMMMmmmmmm...banana nut bread. So yummy! Your recipe is a tad bit different than mine, so I will try yours when I have some ripe bananas. Thank you for the recipe. Looks like you are just about ready!! Merry Christmas! Yum yum yum! You are the best to bake and gift your goodies. It all looks so great. Have a great rest of this week Marty. Wishing you a wonderful Christmas and much health, happiness and new adventures in the brand New Year. You are quite the baker, Marty! I am doing the meal and my sisters are in charge of desserts so I'm off the hook for baking! If I had more time I would make cookies, and I might get that done on Saturday, let's hope. Merry Christmas to you, Marty, and enjoy your time with your family! I can't wait to try your banana bread recipe. I think sour cream adds so much flavor and moistness. Pinning, too. You are going to be one "Happy Baker," because you are doing what you love for the family that you love and hold dear. That's the best kind of happy there is. You may be tired when finished, but it is so very worth it! Warm hugs and best wishes for a very Merry Christmas to you and your family!